The road leading to Investors Group Field is on the path to a $1.3-million overhaul. 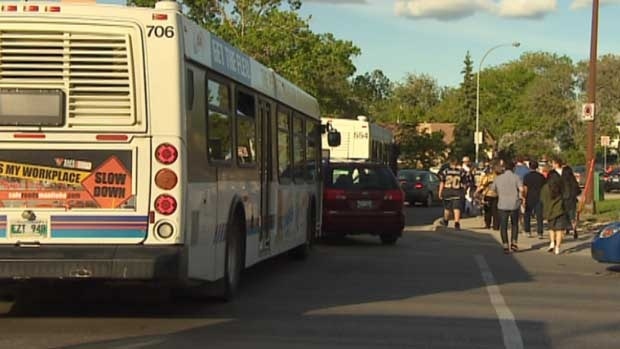 As part of the city’s 2015 pedestrian and cycling plan, a pathway on Chancellor Matheson Road — from Investors Group Field to Pembina Highway — is being proposed to deal with safety issues for pedestrians leaving the stadium. The Chancellor Matheson pathway has been given top priority by city officials thanks to a number of high-profile events over the next few years, including the Grey Cup and women’s World Cup soccer games in 2015. This week, public works committee chairwoman Coun. Janice Lukes added an amendment to the project’s funding which will take almost $200,000 out of the Waverley multi-use pathway budget. The amendment called for the city to look into alternate sources, such as surpluses in the city’s local road renewal fund, to help pay for the project. “A greater percentage of the pathway was actual roadwork that needed to be done to accommodate transit,” she said, noting the scope of the project also includes shoulder upgrades for buses, landscaping, lighting and a spot for the buses to pick up and unload riders. Lukes said because active-transportation funding is often difficult to wrangle from the city, the money for the pathway shouldn’t all come from that source. “A million dollars in pathway work — that could give us more pedestrian sidewalks. It could go massively far,” she said. The 2015 pedestrian and cycling plan heads to council on May 27, 2015 for final approval.